Read on to know how to watch YouTube Video in Picture in Picture Mode on Desktop Google Chrome. If you are using latest Opera browser you might have already familiar with this feature. Opera browser let you detach video from YouTube into a floating window, so you can keep watching the video while browsing other website or doing other work on your desktop PC. 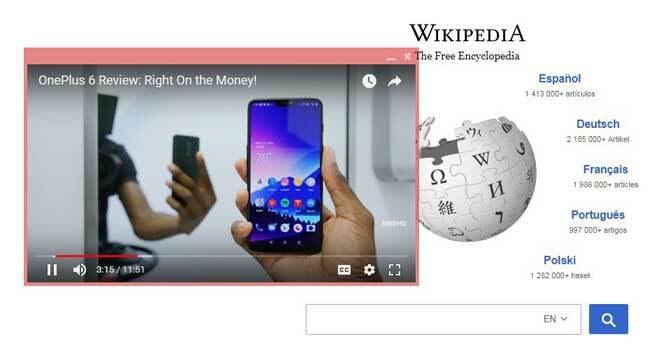 If you do not like to install Opera browser on your PC, but want to watch YouTube Video in Picture in Picture Mode on your Google Chrome, here is how it is. VideoNail - Floating YouTube PIP Player is a new extension for Chrome, which will bring the Picture in Picture mode for desktop. Note that VideoNail allows watching YouTube video in a separate window only on any web page you like, while Opera’s built-in feature lets you watch YouTube video from any webpage, any app you run and more. - First, you need to install the VideoNail extension from here and restart your Chrome browser. - To use the add-on, right click on a YouTube video link or video thumbnail and choose Start VideoNail. - You can also access the feature when playing a video. Scroll down to the comment section of the video and the video player will open in a new window. Note that, you cannot use Picture in Picture Mode with every website. This is because, some sites are set up to block external contents are being loaded.